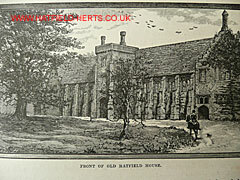 This section contains images of a bygone Hatfield. 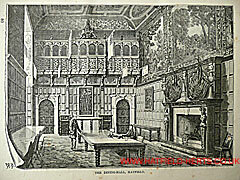 It contains engravings and photographs of views that have changed or no longer exist. One of the official guides produced to cover the various railway companies operating out of London. Contains useful information on the company, its services and various places on its route. 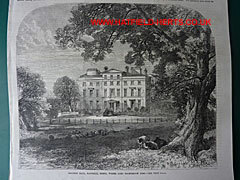 Written by George Measom and produced in 1857, this is said to be the second edition. It was available at all stations on the line and at three retailers (two in London and one in York; only W H Smith and Son is believed to be still in existence). Price one shilling (or two, if you wanted the cloth bound, gilt lettered edition). Our Own Country was an early round Britain travelogue published by Cassell & Company, Limited of London, Paris & New York, around 1890. Volume 2 covers Hatfield. 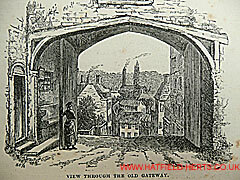 View through the old gateway – something of the reverse view to the above. 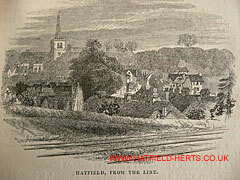 The tall chimney in the middle is probably the Hatfield Brewery. 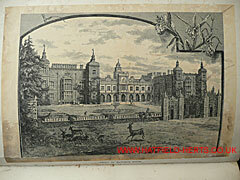 Front of Hatfield House – image at the front of this volume. World's first weekly illustrated (using engravings) newspaper, launched in 1842. This is the Saturday, 28 October 1865 edition, and the engraving below took up over half the front page. 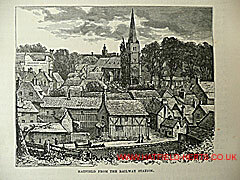 This is a separate section of this site containing a number of postcard views of Hatfield – mainly of the area known today as Old Hatfield, which has changed dramatically. Francis Frith was a Victorian photographer who founded a photographic views company around 1860. The company he founded captured views from across Britain for over a century – including a number in Hatfield taken around the 1950s and 1960s.